(Kaylee McGhee, Liberty Headlines) As their time holding the majority—and with it power to investigate the Left’s ethical abuses—draws to an end, House Republicans on Wednesday led a hearing into the Clinton Foundation and allegations of “pay to play” when Hillary Clinton was Secretary of State. The House Oversight and Government Reform Subcommittee used the Clinton Foundation as a case study to investigate the general oversight of nonprofit organizations, but the question that dominated was: Is the Clinton family charity a means to political ends suffering from corruption and illegalities, or is it a charitable organization that gives back to the community? Tom Fitton, president of Judicial Watch, testified as a whistleblower and said the allegations against the Clinton Foundation are both true and damning. Fitton’s testimony seemed to confirm what has often been seen as the modus operandi for the Clintons: flouting legal and ethical guidelines by muddying the waters of their various conflicting interests, intermixing personal matters with their official duties, much as Hillary Clinton did with her private email server. House Democrats tried to draw attention away from the Clinton Foundation by focusing the hearing on the Trump Foundation and the recent conviction of Michael Cohen, President Donald Trump’s disgraced former attorney. Rep. Mark Meadows, R-N.C., said that since the hearing was on nonprofit organizations in general, Congress would be looking at all foundations. But there’s a “big disparity” between the Clinton Foundation, which brought in $2.5 billion in overall revenue last year, and the Trump Foundation, which raised $19 million. Fitton agreed with Meadows’s assessment and noted that there is evidence proving that the investigation into the Clinton Foundation during former President Barack Obama’s administration was suppressed by the Department of Justice. 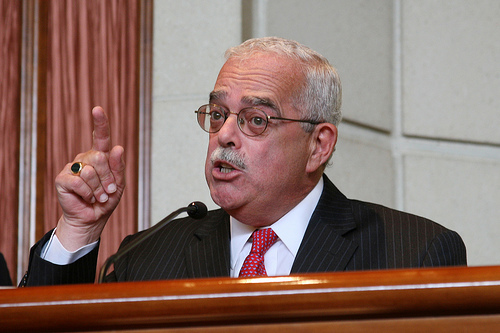 Connolly continued his rant by attempting to downplay Fitton’s charges of corruption within the Obama Justice Department. Rep. Jim Jordan, R-Ohio, responded to Connolly’s accusations by pointing out that several FBI employees recently demoted and/or fired for conspiring against the Trump administration all served under the Obama administration alongside Hillary. A whistleblower report filed secretly more than a year ago with the IRS and FBI reveals evidence of misconduct in the Clinton Foundation and alleges that the Clintons may be liable for millions of dollars in delinquent taxes and penalties, reported The Hill. Jordan also pressed Phillip Hackney, an associate professor of law at the University of Pittsburgh who previously served as an attorney for the Internal Revenue Service during the Obama administration, about the targeting of conservative organizations by the IRS. High-ranking partisan officials, including Lois Lerner, the former director of the IRS’s Exempt Organizations Unit, acknowledged that some wrongdoing transpired in targeting conservative groups disproportionately for extra scrutiny leading up to the 2012 presidential election. Lerner, however, pleaded the Fifth and was able to escape any criminal consequences for the agency’s actions. Hackney said he could not speak to the political specifics, only in broad, general terms to the IRS’s responsibility to police the work of tax-exempt organizations as a practical matter.